Remember when you were a kid? And you walked or even skipped around outside, running barefoot and full of energy? Did you know you were earth grounding then? You were grounding every time your skin, the bottoms of your feet, touched the earth, the dirt, sand, grass, bricks or concrete, especially if your feet were slightly wet, or sweaty, which made them more conductive. You were earth grounding every time you laid on the moist grass, or built castles in the sand at the seashore. It was a good thing happening, and we didn't even realize it. We think you'll love our product, because it helps bring each person, who spends time in contact with our BE WELL Grounding Half Sheet, back toward youthful vitality by grounding to the Earth's electrons for naturally better sleep, less stress, more energy, just as walking barefoot connects you to the earth. It's Ancient Wisdom and Pure Science for healthy living. Half sheet fits any bed, sofa, or reclining chair. Our half sheet is made from conductive material of 95 percent cotton, 5 percent silver grid. Sheet is durable, holds up to hundreds of washings and dryings on the low heat setting. Some benefits that many people have experienced and tested in studies are: increased energy, improved circulation, better sleep quality, less inflammation, faster recovery from trauma, reduced muscle pain, headaches, and chronic pain, reduced menstrual symptoms, and earth grounding benefits the body's protection against the effects of environmental electrical fields, which are often called non-native EMFs, nnEMFs, or electromagnetic radiation, in our modern technical device filled world. 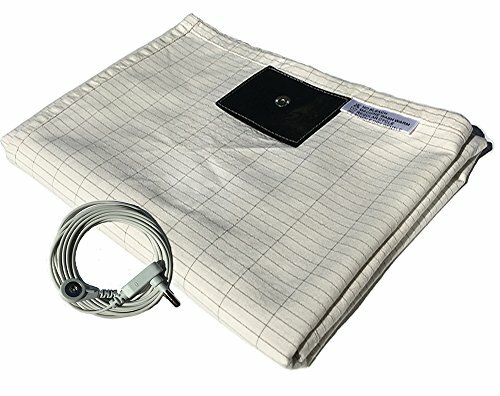 For these benefits it is recommended to allow your bare skin, such as feet, legs, hands, back, etc, to remain in direct contact with the sheet while sleeping, napping, or sitting for long periods of time, overnight, any time of day or night, any length of time, hours or minutes is good for wellness. Be Well, Touch the Earth. Be Well Grounding Half Flat earth-grounding Sheet 84 x 23 inches (may vary slightly), although it doesn't cover half of all beds, it's customary to call it a half sheet, it does fit any bed, crosswise or lengthwise, to be placed on top of your regular bottom sheet. Cotton with silver-thread conductive grid. Color is Ivory with silver grid pattern. If you have any questions about this product by Be Well Grounding, contact us by completing and submitting the form below. If you are looking for a specif part number, please include it with your message.